Local newspaper advertising encouraged food thriftiness, Port Arthur Daily News Chronicle, 3 May 1916. 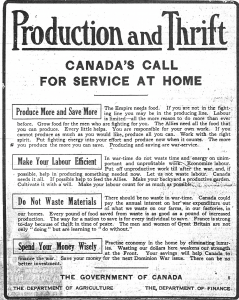 ActiveHistory.ca is featuring the following paper as part of “Canada’s First World War: A Centennial Series on ActiveHistory.ca”, a multi-year series of regular posts about the history and centennial of the First World War. It was first published by Papers & Records, Thunder Bay Historical Museum Society, 2014.